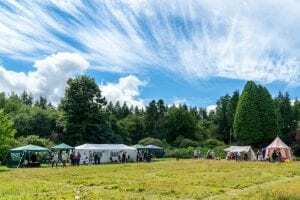 On the 4th and 5th of August our wonderful volunteers organised a superb and greatly successful weekend. Even the weather was beautiful to go with it. Hundreds of visitors came to explore the house and gardens over the two days and enjoyed the activities on offer. Visitors had sandwiches, cakes and teas made by the volunteers of Bannockburn House and served in our large marquee by ladies dressed in Victorian outfits. Our guests were treated to live music performed by ‘Feis Phaislig’ from Paisley on the Saturday, a 5 piece traditional music band who were on tour. 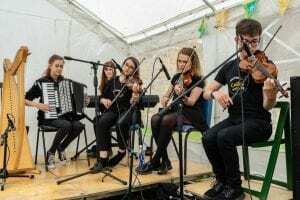 On the Sunday, ‘Ceilidhsquared’ a 3-piece traditional music band performed. ‘Ceilidhsquared’ have performed at Bannockburn House previously and have very kindly offered to come back again for our Christmas event. Don’t miss out when the tickets become available. At the entrance road to Bannockburn House, was the metal detecting/archaeology dig which was supervised and managed by Guard Archaeology over the 3 days, Friday to Sunday. Many items were found such as buttons, coins and horseshoes but unfortunately, not the Jacobite gold we were hoping for, maybe next time! Guard have taken all the finds for analysis and will report back in due course. Archaeology Scotland provided Bannockburn House with boxes of various artefacts from the Roman period and industrial age for people to handle. We had sand trays with artefacts for children to excavate and all this was supervised and managed by Stirling Young Archaeologist Club who volunteered their services to help out and provide their incredible knowledge about archaeology and history. Colin from Stirling Young Archaeologist came across a chance find of a piece of medieval glass in the grounds of the house over the weekend, which was really exciting. 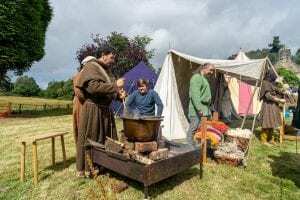 We had medieval re-enactors camping on site over the weekend and they provided our visitors with fighting displays, archery and medieval style dying wool and all this thanks to Brittania IXV who also volunteer at Bannockburn House. There was history ‘Explorer Awards’ for kids which were particularly popular. The challenge was to collect stickers by completing various activities and when completed they received amazing prizes of real Victorian penny’s along with a well-earned explorer Explorer Certificate. As well as the fantastic live music, some of our visitors were enthralled by a young man called Adam from Forth Valley Magic Circle who was a wizard with the Rubix cube and amazed us with his card tricks. The Stirling Smith Museum provided ‘Tales of the Victorian School Master’to delight and possibly scare our visitors and children, they also enjoyed getting their faces painted during the weekend. 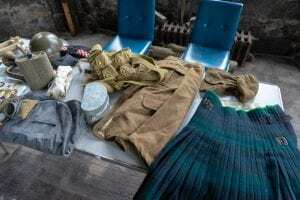 The Argyll and Sutherland Highlander Museum from the castle brought along items from the world wars for people to handle and talk about. This proved particularly popular with our visitors. Down at our chauffeur’s cottage area we had the courtyard café. 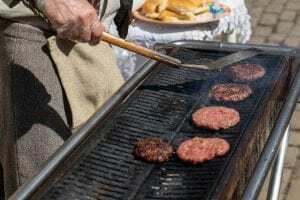 People could sit and eat cakes and good old-fashioned burgers, cooked on the BBQ whilst enjoying their teas and coffees and watching the world go by. Just along from the café was the Jacobite History Group who were exciting our visitors with tales about Jacobite History and the uprisings and the involvement of the women who played a major part in this era. The group also demonstrated how some of the weapons were used. The cottage area looked beautiful in the sunshine with all the decorations and the candy cart provided by ‘From Me to You’ in Falkirk. Back up in the house, regular tours were being taking by members of our history team who have worked extremely hard to research information about the house and of the families who have lived there through its 400 years. The tour guides were kept very busy as the demand for tours far exceeded our expectations on both days of the garden party. So much so that we had to draft in other history guides and add in extra tours. We had so many we lost count on Sunday after 400 or so visitors. There were many first-time visitors who enjoyed their walk-through history and many return visitors, who were impressed at the improvements made since their last visits. 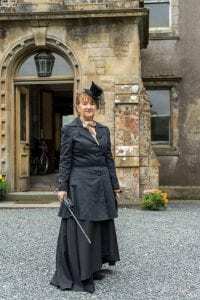 Adults and children alike were regaled with many stories of what life was like in Victorian times for the occupants of the house “upstairs and downstairs” as well as viewing the stunning ceilings and curiosities. Some tours were even led by the Lady of the Housewho was still in her riding habit! Our Jacobite friends also explained how a “philibeg” was worn and how to hold and use the 18th century weapons. They also told stories about the Bonnie Prince’s time at the house and of his Lady, Clementina Walkinshaw. Our Jacobite friends were based in ‘Charlie’s Room’, the room where Bonnie Prince Charlie stayed during the weeks following the Battle of Falkirk and before the fateful move to Culloden. More stories of the uprisings and plight of the Jacobite’s were to be gained here and our visitors were also greeted outside the main door with the wonderful sound of the highland pipes played by one of the Jacobite’s. 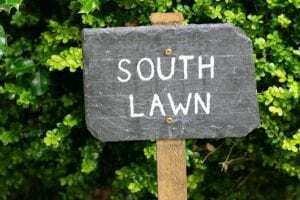 The south lawn looked lovely with our gardeners having cut the grass to replicate the impressive ceiling in the main hall and provide a mini maze which the children really enjoyed running around. We signed up over 100 new trust members and volunteers over the course of the weekend who are keen to support and be a part of this wonderful project. 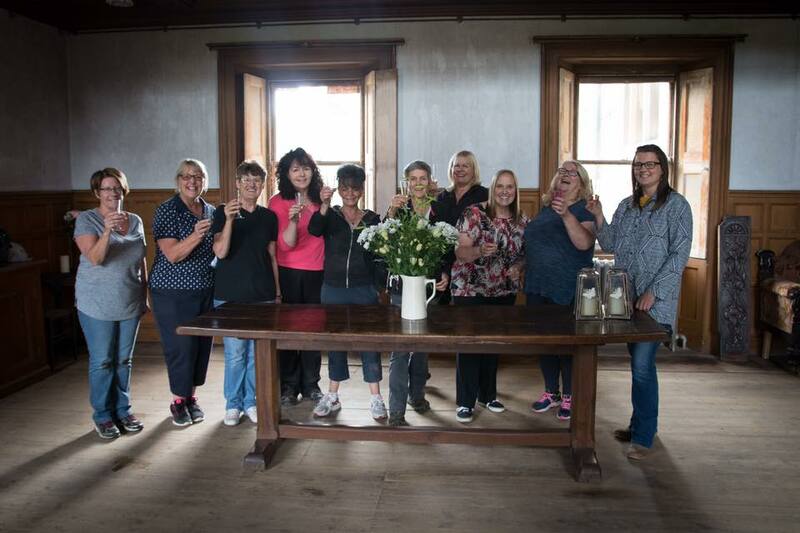 All this was organised and put in place by the hardworking and committed volunteers at Bannockburn House without whom none of this could have been possible. 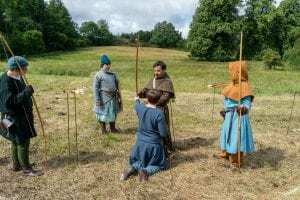 Bannockburn House Trust would like to say a big thank you to everyone who gave their free time willingly to make this weekend a really successful and fun event. Previous story We need you!